The war on Libya started in March 2011. This article was originally published by GR in September 2011, following the devastation triggered by seven months of intensive NATO bombings. Today, Libya as a country and a nation state has been destroyed. 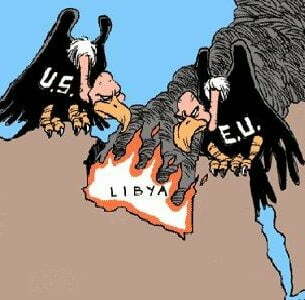 Under Nuremberg, the leaders of the NATO member states involved in the war on Libya are war criminals. “There is no tomorrow” under a NATO sponsored Al Qaeda rebellion. While a “pro-democracy” rebel government has been instated, the country has been destroyed. The rebels are casually presented as “liberators”. The central role of Al Qaeda affilated terrorists within rebel ranks is not mentioned. “Starting afresh” in the wake of destruction? Fear and Social Despair, Countless Deaths and Atrocities, amply documented by the independent media. No euphoria…. A historical reversal in the country’s economic and social development has occurred. The achievements have been erased. The NATO invasion and occupation marks the ruinous “rebirth” of Libya’s standard of living That is the forbidden and unspoken truth: an entire Nation has been destabilized and destroyed, its people driven into abysmal poverty. The objective of the NATO bombings from the outset was to destroy the country’s standard of living, its health infrastructure, its schools and hospitals, its water distribution system. And then “rebuild” with the help of donors and creditors under the helm of the IMF and the World Bank. The diktats of the “free market” are a precondition for the instatement of a Western style “democratic dictatorship “. An entire nation has been bombed with the most advanced ordnance, including uranium coated ammunition. Already in August, UNICEF warned that extensive NATO bombing of Libya’s water infrastructure “could turn into an unprecedented health epidemic “ (Christian Balslev-Olesen of UNICEF’s Libya Office, August 2011). These developments are in sharp contrast to what most Third World countries were able to “achieve” under Western style “democracy” and “governance” in the context of a standard IMF-World Bank Structural Adjustment program (SAP). Public Health Care in Libya prior to NATO’s “Humanitarian Intervention” was the best in Africa. Confirmed by the Food and Agriculture Organization (FAO), undernourishment was less than 5 %, with a daily per capita calorie intake of 3144 calories. (FAO caloric intake figures indicate availability rather than consumption). The Libyan Arab Jamahiriya provided to its citizens what is denied to many Americans: Free public health care, free education, as confirmed by WHO and UNESCO data. According to the World Health Organization (WHO): Life expectancy at birth was 72.3 years (2009), among the highest in the developing World. Gross primary school enrolment ratio was 97% for boys and 97% for girls (2009) . The pupil teacher ratio in Libya’s primary schools was of the order of 17 (1983 UNESCO data), 74% of school children graduating from primary school were enrolled in secondary school (1983 UNESCO data). Based on more recent date, which confirms a marked increase in school enrolment, the Gross Enrolment Ratio (GER) in secondary schools was of the order of 108% in 2002. The GER is the number of pupils enrolled in a given level of education regardless of age expressed as a percentage of the population in the theoretical age group for that level of education. For tertiary enrolment (postsecondary, college and university), the Gross Enrolment Ratio (GER) was of the order of 54% in 2002 (52 for males, 57 for females). With regard to Women’s Rights, World Bank data point to significant achievements. In most developing countries, essential food prices have skyrocketed, as a result of market deregulation, the lifting of price controls and the eliminaiton of subsidies, under “free market” advice from the World Bank and the IMF. In recent years, essential food and fuel prices have spiralled as a result of speculative trade on the major commodity exchanges. Libya was one of the few countries in the developing World which maintained a system of price controls over essential food staples. The Libyan Arab Jamahiriya had established a system of price controls over essential food staples, which was maintained until the onset of the NATO led war. While rising food prices in neighbouring Tunisia and Egypt spearheaded social unrest and political dissent, the system of food subsidies in Libya was maintained. These are the facts confirmed by several UN specialised agencies. War and Globalization are intiricately related. The IMF and NATO work in tandem, in liason with the Washington think tanks. The NATO operation purports to enforce the neoliberal economic agenda. Countries which are reluctant to accept the sugar coated bullets of IMF “economic medicine” will eventually be the object of a R2P NATO humanitarian operation. Today we call it “Regime Change” and “Missile Diplomacy” which invariably takes the shape of a UN sponsored “No Fly Zone”. Its objective is to impose the IMF’s deadly “economic medicine” of austerity measures and privatization. 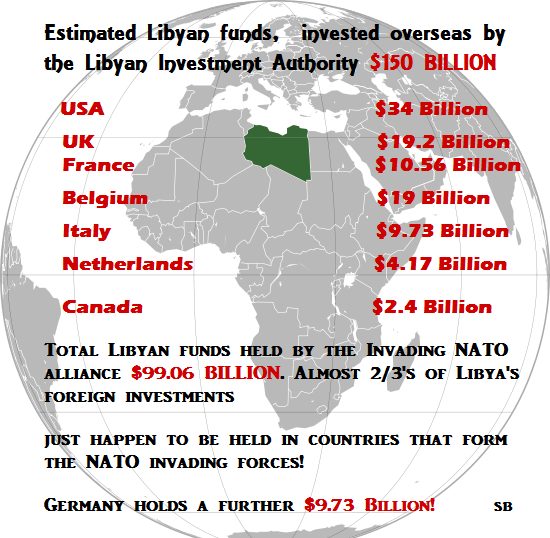 Libya`s frozen overseas financial assets are estimated to be of the order of $150 billion, with NATO countries holding more than $100 billion. Prior to the war, Libya had no debts. In fact quite the opposite. It was a creditor nation investing in neighboring African countries. The R2P military intervention is intended to spearhead the Libyan Arab Jamahiriya into the straightjacket of an indebted developing country, under the surveillance of the Washington based Bretton Woods institutions. Getting IMF recognition is significant for Libya’s interim leaders as it means international development banks and donors such as the World Bank can now offer financing. The Marseille talks came a few days after world leaders agreed in Paris to free up billions of dollars in frozen assets [stolen money] to help [through loans] Libya’s interim rulers restore vital services and rebuild after a conflict that ended a 42-year dictatorship. The financing deal by the Group of Seven major economies plus Russia is aimed at supporting reform efforts [IMF sponsored structural adjustment] in the wake of uprisings in North Africa and the Middle East. Michel Chossudovsky is an award-winning author, Professor of Economics (Emeritus) at the University of Ottawa. He is the Founder and Director of the Centre for Research on Globalization (CRG), Montreal and Editor of the globalresearch.ca website. He is the author of The Globalization of Poverty and The New World Order (2003) and America’s “War on Terrorism” (2005). He is also a contributor to the Encyclopaedia Britannica. His writings have been published in more than twenty languages. Yes it was a dictatorship. Yet the country prospered under its government. The UN and NATO chose to destroy the country economically, politically and humanitarily. This was nothing more then war crimes personified. No excuse can defend the brutal actions of these two war mongering groups. What happened here could obviously happen to you and your country until and unless these thieving killers are served and adiquite punishment is enforced. Think back a couple of years during the obama administration when trains of hundreds of military vehicles all labeled with the UN insignia were being transported around the United States. Where are they now? What nefarious plans are waiting to be set upon our nation? Don’t kid yourself, these things are happening at a much higher level then our President can control. I believe that out money is next to be taken down to attempt a global money system run by the IMF and the UN. PLEASE REMEMBER THE ROLE OF THE UN IS NOW TO ESTABLISH A ONE WORLD GOVERNMENT. This is the key point you must understand in order to make sense of what is going on “behind the green curtain”. Take care, be careful well and most of all be alert. The American people have been lied to about Lybia, Qaddafi, Sadam and Bin Laden. Qaddafi and his country were rich beyond imagination, he had stock piles of Gold and he refused to join the central banking system so they killed him and stole his gold. Now that area North Africa is a Hub for human trafficking. Obama and Hillary ruined Lybia. Qaddafi gave his people everything for Free, but the MSM told you he was a Dictator and a Monster. Question Everything, do your own research. The truth is out there, but you wont find it if you dont look for it.